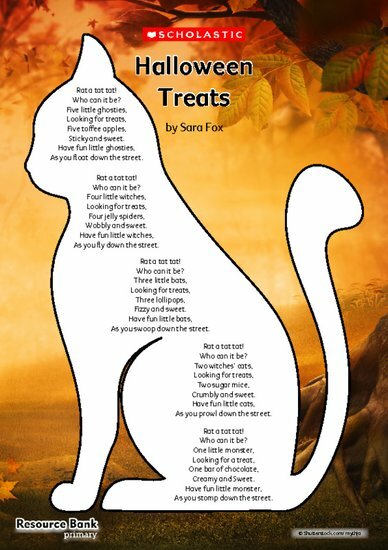 Use this beautiful poem to celebrate Halloween in your setting. It’s a great way to practise counting and literacy skills. Children can have fun following simple recipes to make Halloween treats such as ghosts made from fondant icing, biscuits decorated with pumpkins or pots of scary jelly. With a dressing-up box filled with spooky costumes such as witches, wizards, cats and bats, children could take it in turns to ‘rat a tat tat’ at the home corner door and wish each other a happy Halloween. This could be modelled by an adult to encourage politeness and good manners.